Executive Summary: Cloud computing has emerged as one of the most significant game changers to hit the technology landscape in the past 20 years. With this massive expansion of the cloud, the perception of the IT organization is shifting from a utility player to a change agent. 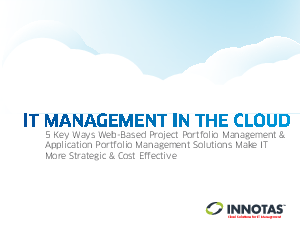 This eBook breaks down five ways progressive organizations are using cloud-based IT Management solutions to help drive innovation and become more strategic, including: adding visibility and analytics, speeding up time-to-value, lowering costs, improving prioritization, and providing a blueprint for future cloud deployments.